Added calculation of the price history of synthetic symbols for the entire available data depth. The platform calculates the history of one-minute bars based on minute bars of instruments as applied in its formula. Previously, the history was only calculated for the last two months. A deeper history could be created upon an explicit request (when scrolling the chart to the left or calling Copy functions). Now, the history is calculated using all available data unconditionally. If deep history of used symbols is available, the synthetic symbol history calculation can take quite a long time. 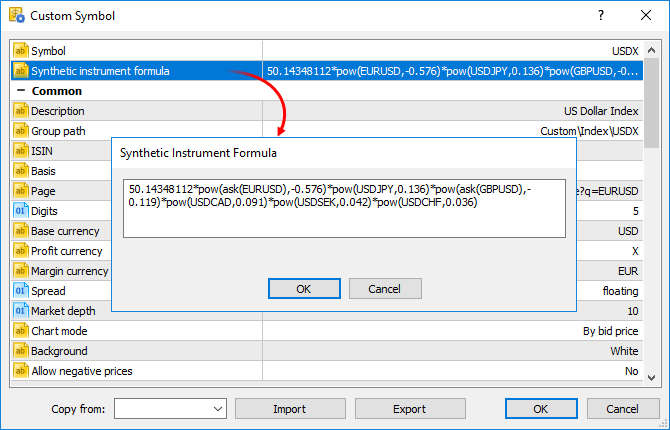 To enable immediate synthetic symbol chart view, the history for the last two months is calculated first (similarly to calculations in previous versions). Calculation of an earlier history begins after that. New property ACCOUNT_CURRENCY_DIGITS — the number of decimal places in the account deposit currency. Use the AccountInfoInteger function to get the property. You may use the property when calculating profit on your own, to normalize the values ​​obtained. Fixed delay in the execution of Copy functions and i-functions during operations with the weekly timeframe. Fixed operation of the WebRequest function. Added ability to perform a single Expert Advisor test after downloading optimization results from a cache file. The new version features a faster initial download of price history by local agents.